We see on ecommerce websites that with each payment method you choose while checking out, there is often a service charge or even a discount associated. It is also noteworthy that the service charge for Cash-on-Delivery is higher than that for alternative payment methods. This is to increase the chances of pre-payments. Pre-payments help to not just to reduce the risk of not getting paid by the customer, but also to ensure cashflow in the business. In case of no service fee associated with payment methods, there may be discounts offered when you choose to pay with methods other than Cash-on-Delivery. You also may want to add discounts against certain payment methods depending on schemes or promotions that you may want to run. Discounts are attractive in general to customers, and help in increasing sales. In this post, we will show you the various ways you can add charges or discounts for different payment methods in WooCommerce and consequently reap benefits of the same. 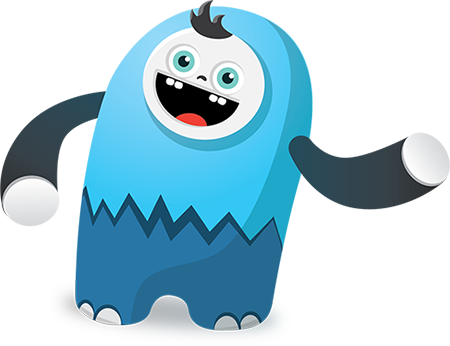 You can achieve this by adding code snippets in the functions.php file of your child theme. The code below adds a discount to the total amount when PayPal is chosen as the payment method on WooCommerce checkout page. By assigning a value to $percent, you can specify the percentage of discount you wish to apply on the desired payment method. 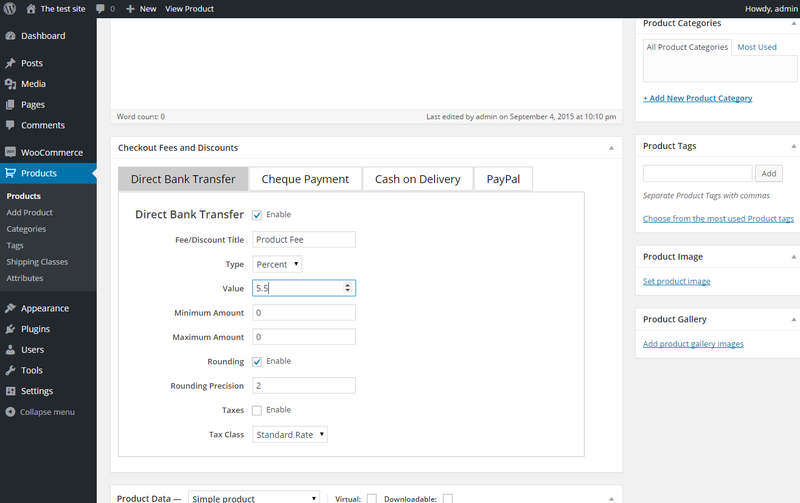 The default payment methods in WooCommerce are Direct Bank Transfer (bacs), Check payments (cheque), Cash on Delivery (cod) and PayPal (paypal), with their ids mentioned in the brackets. The values that the payment methods have for Direct Bank Transfer, Cheque, Cash-on-Delivery and PayPal are bacs, cheque, cod and paypal respectively. The add_fee() function is an in-built method of the WC_Cart class in WooCommerce. To add a service charge, you simply have to change the sign of one of the arguments in the add_fee function from “-” to “+” or no sign at all which implies positive. If you don’t want to add code snippets, there is an easy way out to achieve the same – plugins! There are both free and paid plugins that offer different features. This is a free plugin by WPCodelibrary that provides a simple interface inside your WordPress Dashboard to set discounts for the default payment methods provided by WooCommerce. It however does not have a feature to add service charges or fees. This premium plugin by us comes with a whole set of features where you can add fees as well as discounts for different payment methods based on country, state, product category etc. 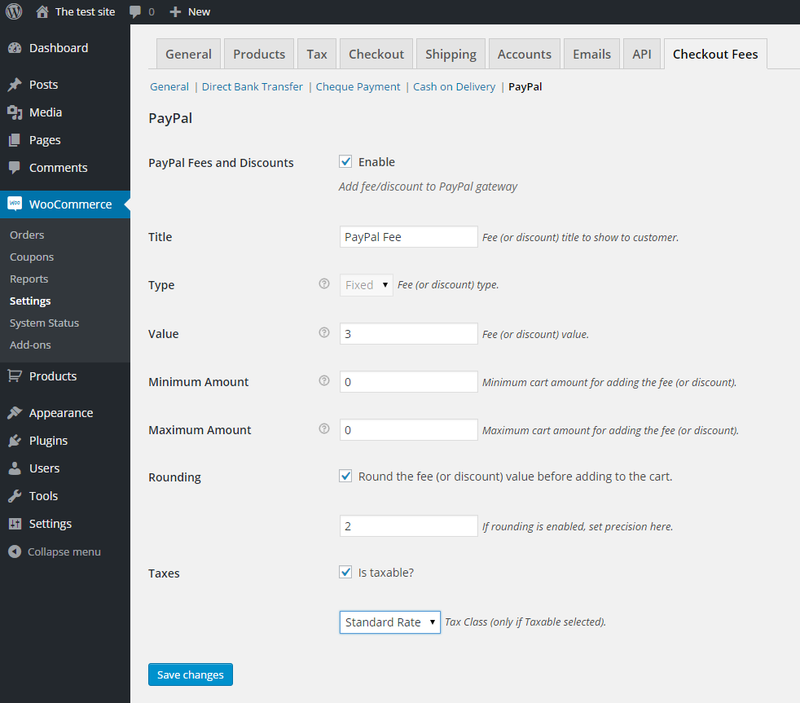 Besides this, you can also apply taxes on the fees (excluding shipping charges) using the plugin. The interface is simple and user-friendly, and you can also apply different discounts and fees for individual products.